Now, I should say that this is not my first experience with a Blood Bowl comic book. Back in early 2009, Boom! Studios released a Matt Forbeck written comic called Blood Bowl: Killer Contract. I stumbled across a trade paperback collection of the issues several years later in the graphic novel section of Half-Priced Books here in town. The best that could be said of Blood Bowl: Killer Contract is that it’s a comic book set in the Blood Bowl universe. I guess I couldn’t really have expected much more as I’m sure it’s not exactly easy to write a story about a board game. Still, I was a little disappointed that the comic didn’t revolve around a particularly important team or involve major Star Players. Aside from that, it was a reasonably enjoyable read. 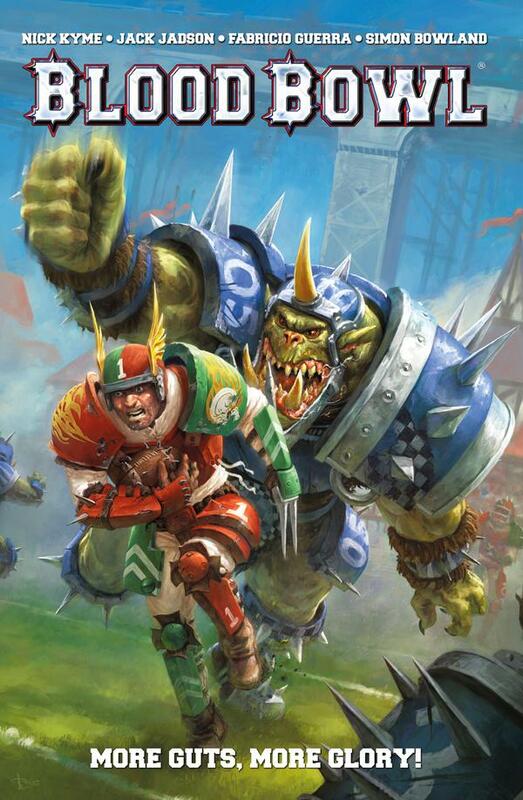 With my original Blood Bowl comic book experience in mind, I had realistic expectations for More Guts, More Glory! and as such, I was able to enjoy the read a bit more than Killer Contract. Like Killer Contract, More Guts, More Glory! 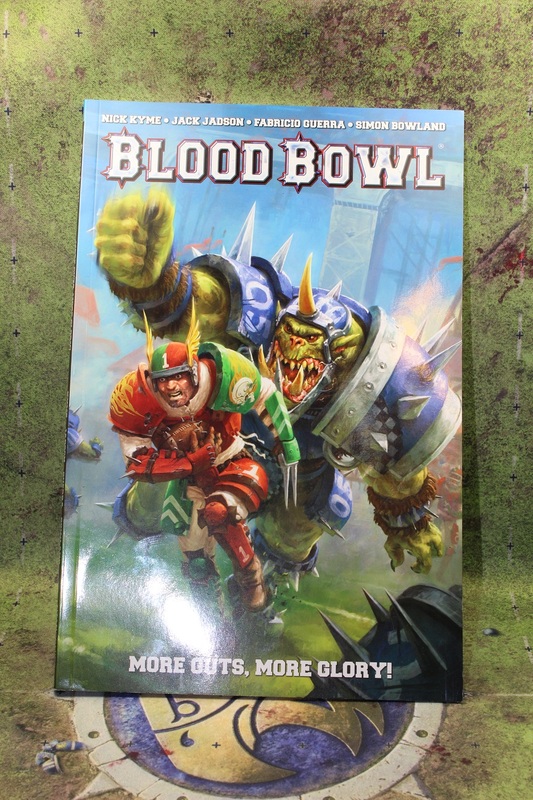 is really just a story set in the Blood Bowl universe. The game itself is more of a backdrop than anything as the story focuses on Dreng Sturnblud. Dreng is a past his prime Blitzer who is given a second chance to lead his new team to victory. Along the way, he has to deal with scheming Dwarves, minions of Chaos, and various other bad types. As a bonus, here are some pics from Blood Bowl: Killer Contract in case anyone is interested in picking up a copy on Amazon or eBay. This entry was posted in Blood Bowl, Gaming and tagged Blood Bowl, Blood Bowl Killer Contract, Boom! Studios, Comic books, Games Workshop, Killer Contract, More Guts More Glory, Titan Comics by Mike C. Bookmark the permalink. I’m a fan of graphic novels. Also of Blood Bowl. So naturally I did pick up both of those series. I picked up digital copies through Comixology. I didn’t care for the art on Killer Contract very much. The story was okay. I think things are a bit better with More Guts, More Glory. I’d be curious to see another mini-series by the same artist/writer. Both stories felt pretty similar to me. I think to break that mold, they should focus on a non-human team. I’d love to see a mini-series based on the Chaos All-Stars (the original Chaos Pact team), as they are just crazy looking and I imagine they would have some interesting personalities to deal with. Snake Sanders, Dieter Hammerlash, Constrictor Atlanson, and more. Where did Acid Scarred Max get his name from? How come Snake Sanders has a snake head? There is a wealth of material there. I agree. There is a lot of material to pick from to write about. I would love to see something a little different if they do another.